First 150 fans to show their 11.12 Pharmasave Canucks calendar at the Team Store at 10am will get a voucher. Signing will take place at 4pm. Pumpkin decorating, crafts, magic, costume contest for dogs, chance to win XBox at City Square. Smirnoff sampling and a chance to win Kanye West and Jay-Z tickets. Kids are invited to go trick-or-treating at participating businesses. There is a costume contest as well. Photos will be taken at Brechin Maclean Photography at 200-3580 Moncton Street. A night of music, flowers, tea, candles and prayers to remember the dead at Mountain View Cemetery. Witness zombies dance to Michael Jackson's Thriller simultaneously all over the world! Dragon's Den fans take note! Kevin O'Leary will be at the Chapters on Robson this Tuesday, October 25th. 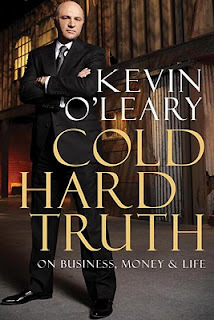 There will be a Q&A session with the ruthless Dragon, followed by a signing of his new book: Cold Hard Truth. Word of caution: Occupy Vancouver might show up to protest but everything should be peaceful. Went out to eat on an impulse last night with my sis and coworker. I decided I wanted to try out a restaurant for Taste of Yaletown and looking at Open Table and saw that several restaurants still had reservations available. I choose to go with Section (3) mainly because of the Jumbo Prawns they offered on their menu. Hahah. My sis and I choose to order from the Taste of Yaletown menu while my coworker opted for the traditional menu. We both ordered the same appetizer: Grilled Lamb Chop with potatoes au gratin. I liked it though K said that it was a tiny bit gamey. I don't know since it doesn't bother me. Eat the lamb chop first because the potatoes are more flavoured than the lamb. K ordered the "Shepherd's Pie" and that was pretty good too. I prefer my prawns though. Braised Beef Short Rib "Shepherd's Pie"
My coworker ordered yummy ribs which was accompanied by Mac n' Cheese. As you can see his portion was much bigger...but he didn't have an appetizer or dessert. All in all it was a satisfying meal and the service wasn't bad either. Not a lot happening this weekend. The biggest event is the Free movies at Cineplex theatres on Saturday. There are also several food related events going on. Remember that Taste of Yaletown is happening until the 30th! So it's a great opportunity to try some Yaletown restaurants out! “Diwali Downtown” Cultural Extravaganza - I think admission is by donation? 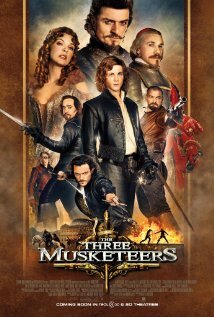 A cocky, young man named D'Artagnan (Logan Lerman) leaves home to fulfill his dream to join the Musketeers. Unfortunately, due to a disastrous mission a year ago, the three legendary Musketeers, Athos (Matthew Macfadyen), Porthos (Ray Stevenson), and Aramis (Luke Evans), have become cynical, drunk, poor and quite down on their luck. France is now being run by a young boy king who seems to be more interested in the latest fashion than ruling so the church Cardinal holds most of the power who is only held in check by the queen. In hopes of seizing the throne, the Cardinal tries turn the king against the queen with the help of Milady de Winter (Milla Jovovich) by stealing the queen's necklace to implicate her having relations with the Duke of Buckingham (Orlando Bloom) who is currently in the midst of peace talks with the king. Now it is up to D'Artagnan and the Musketeers to retrieve back the stolen jewels and prevent the take over of the throne and all out war. The movie is amazing! It is full of action, adventure and romance. All the stuff I like. Heheh. Despite being French story, all the characters sounded English to me. Superb acting by the cast. It was hard to image Orlando Bloom as being evil but he was SO EVIL. Being shot in 3D, it is expected that Three Musketeers had lots of cool 3D effects throughout the movie. I wasn't disappointed. Expect to see flying ships, espionage, betrayal and all around good time fun. There were some nice group sword fighting sequences as well as a nail-biting one-on-one between D'Artagnan and Buckingham. The movie is also nicely set up for a sequel. I can't wait! Getting married or know someone who is? The Urban Wedding Show is offering free tickets to people looking for ideas for their wedding! You'll be able to meet the industry’s hottest vendors and learn about table décor, jewelry, honeymoon ideas, invitations, musicians, photographers, florists and more to plan that perfect wedding at this event so don't miss out! There's also a chance to win over $15,000.00 in prizes! Just type in 'urban' for the coupon code when registering for the event. Note that one registration will only allow one person to attend. If you wish to bring a friend they must also register with a unique phone number and email address. Enjoy! Urban Vancouver Wedding Show from Urban Vid on Vimeo. The first Canadian franchise of Tossed, the healthy meal store will be opening its doors on Friday, October 21st! Made-to-order gourmet salads, crepe wraps and sandwiches are just some of the healthy foods they serve. This is great for people who work downtown and want an alternative to all the fast foods available. But wait! There's more! On Thursday, October 20th (one day prior to their grand opening), Tossed will hosting a "Free Food Day" and offering customers a free entree from 11am - 2pm! Go and try out their food! While quantities last and I'm sure it'll be popular so get there early! Follow Tossed on Twitter and Facebook for up to date details. * Sol Guy * Chin Injeti * DJ Flipout * Ndidi Cascade * Jonathan Simkin * Rob the Viking of the Swollen Members * Moka Only * Red1 of the Rascalz * Discreet Da Chosen 1 * Emotionz * JB the First Lady * Jonathan Simkin * Dr. Charity Marsh * Bill Miller * Ari Wise and more!